Elizabeth Taylor in that white swimsuit from a key scene in Suddenly, Last Summer. Was she ever any hotter? Photo from Doctor Macro. Elizabeth Taylor, one of the last of the old Hollywood legends of beauty and glamour, died yesterday. I am a huge Tennessee Williams fans so I especially loved her as Maggie in Cat on a Hot Tin Roof and as Catherine in Suddenly, Last Summer. My other favorite Elizabeth Taylor movies are Butterfield 8, A Place in the Sun, and Who's Afraid of Virginia Woolf? 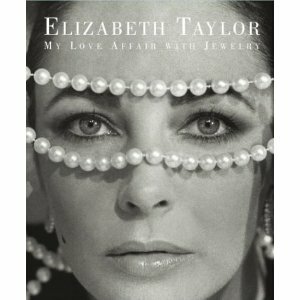 The cover of the 2002 book Elizabeth Taylor: My Love Affair With Jewelry. "After starring in Cleopatra in 1963 and marrying Richard Burton, Elizabeth Taylor began collecting one of the best private jewelry collections in the United States. 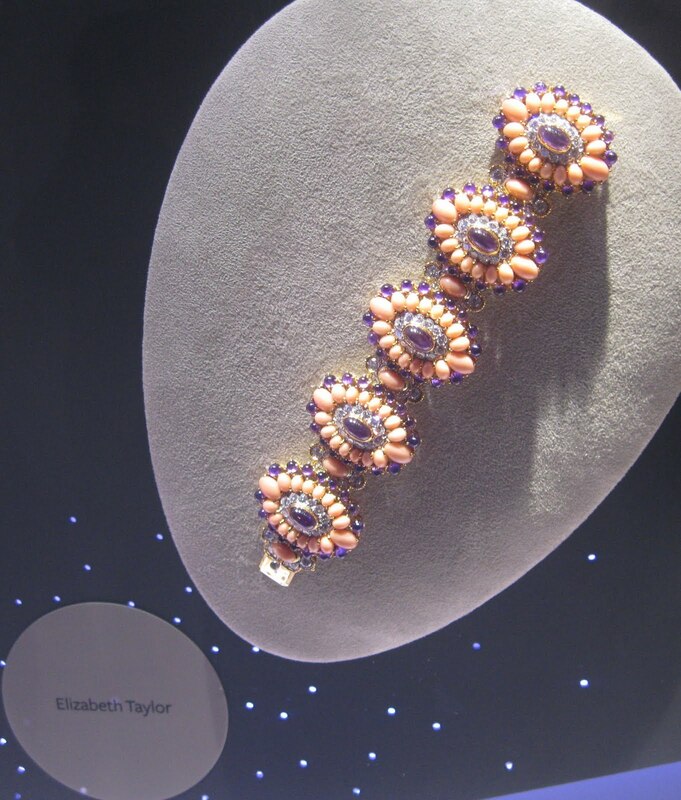 On an excursion to Geneva in 1971, Burton bought his wife this Lamartine bracelet along with the matching ear pendants to highlight her violet eyes." Lamartine bracelet. Paris, France, 1970. 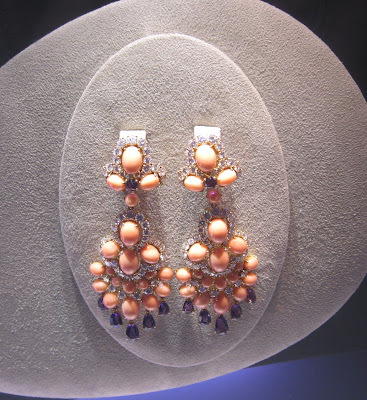 Coral, amethysts, diamonds, platinum, yellow gold. Lamartine pair of pendant earrings. Paris, France, 1971. Coral, amethysts, diamonds, platinum, yellow gold. What a jewelry collection. What a life! What a legend, she will be truly missed. And her beautiful jewelry collection...those gorgeous pieces you shared, coral and amethyst, what a beautiful combination. I had forgotten she had written a book about her jewelry. She certainly had a fabulous collection. Thank you for this wonderful post. A beautiful tribute. What an amazing photo of her. And those are amazing jewels! The tributes keep pouring in for Liz on the internet - I remember watching National Velvet as a girl. I want to look at ET's jewelry book now. I think it's out of print but maybe it will be brought back. I'm sure it's gorgeous. I can't think of anyone else with such a large jewelry collection. All the stars today just borrow things, they never own them. Hi Sacramento, I saw an image of Elizabeth Taylor once that made me think it wasn't an exaggeration, she really did have violet eyes. Hi Veshoevius, I need to see National Velvet. I'm totally dating myself but I watched International Velvet with Tatum O'Neal. Did you see that one? I loved it when she stashed all the money she saved to buy a horse in an old tea tin. Oh my -- I adore those jewels! The gems and color combination are unusual and yummy, and I can see how they would be so exquisitely flattering to Ms. Taylor. Hi Sarah, I wish we could go to this Van Cleef & Arpels show, I think you would really love it and I need to see it again. 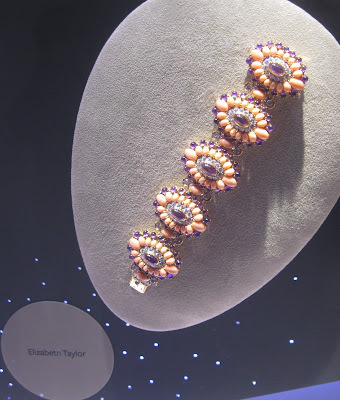 There were two other pieces of jewelry on display belonging to Elizabeth Taylor but I didn't photograph them. I'm glad I snapped these, the amethyst and coral are so unusual and yet beautiful together.